Beginning in October, Vermont gun dealers will not be permitted to sell a handgun magazine of more than 15 rounds, or a rifle magazine with more than 10 rounds, or they will be violating the law. The new limits are well below the capacity that is required for competitions. SHOOTING IN VERMONT: Vermont has been a destination for shooting enthusiasts, but that could change if visitors are subject to the restrictions of new gun law S.55. Before the bill was finalized, gun-rights advocates were able to get lawmakers to delay enforcement of the magazine limits for out-of-state visitors until July 1, 2019. 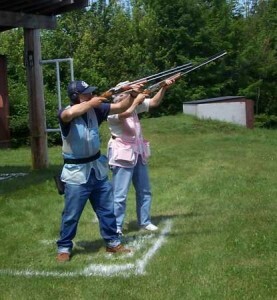 However, those same advocates say the future of shooting competitions has become uncertain, and gun owners may get confused because Vermonters who already own magazines with standard capacities will be able to continue to use them. “We’re inviting a situation where a hapless competitor just comes to Vermont thinking he’s going to compete in an as-issued military match [using the clip that comes with the gun], and suddenly he finds himself against the law because he inadvertently happened to bring along 20-round magazines when all Vermonters there are going to be using a 20-round magazine, because they probably had them before this ridiculous ban had been put in place,” Chris Bradley, president of the Vermont Federation of Sportsmen’s Clubs, told True North. Vermonters are still going to be able to use magazines of any size in the competitions because S.55 bans the sale of any new standard or “high” capacity magazines starting in October. Magazines purchased prior to October will still be lawful. Bradley noted the one-year delay buys some time so that competitions this year can function normally. One lawmaker who tried to amend S.55 to allow out-of-state visitors to participate in competitions with standard or high capacity magazines is state Sen. John Rodgers, D-Essex-Orleans. He urged the Senate Natural Resources and Energy Committee to adopt such an amendment in May, but his colleagues wouldn’t go for it. Rodgers is running for the governorship as a write-in candidate, and it is widely expected that he will make the Second Amendment a centerpiece of his campaign platform. Bob DePino, vice president of Gun Owners of Vermont, expects the state to see a negative economic impact if people are prevented from coming to shooting competitions. “It’s also revenue for local businesses,” he said. “You have to sleep and eat somewhere, so local motels and restaurants are all going to be affected because there’s not going to be anyone coming to these events. He pointed out the groups that hold the competitions also will take an economic hit because it’s a source of their revenue. Bradley says while S.55 will cause much trouble for the gun competitions and law-abiding Vermonters, it’s not going to achieve its aim to keep standard capacity magazines out of the hands of criminals. He noted that magazines don’t have serial numbers or any markings that would allow law enforcement to know when and where they were purchased. DePino said the new law only hurts those who use guns the right way. “This is part of the problem in Vermont — we don’t punish the criminals, but we punish the law-abiding citizens,” he said. DePino reminded that S.55 and the other new gun laws have ignited a new wave of candidates for this year’s election season, and they are ready to grab seats in the House and Senate and fight for Vermonters’ constitutional rights. “There are a bunch of people — they are running as constitutionalists, and I think that’s where the other side of the fence wants to change it. They don’t like it, they want the government to be in total control,” he said. CORRECTION: This article originally stated that out-of state-residents will not be allowed to bring standard- or high-capacity magazines into Vermont starting in October. The correct date is July 1, 2019. This is unfortunately true. I live in Montreal and come down to Vermont many times a year for IPSC/USPSA competition. Unfortunately, S.55 will prevent us and other out of state competitors from shooting in the Limited division. Technical correction to this article. Out of state citizens can continue to bring rifle magazines over 10 rounds and pistol magazines over 15 rounds into the state and then leave with them, legally, until July 1 2019. The October date mentioned above is the date that magazines with higher capacities than 15 (pistol) or 10 (Rifle) can no longer be sold in Vermont. As initially written, the ineffective, unenforceable and therefore ridiculous mag ban portion of S.55 would have stopped out of state citizens from entering the state with these higher capacity magazines on July 1 2018. While the Federation and others vehemently argued to have that section removed, thus allowing out of state citizens to have the same rights as Vermont citizens (Equal Protection Under Law), and we argued that leaving this restriction in would negatively impact not only revenue from shooting events but also the revenue to local businesses by having out-of-state citizens come into Vermont and spend their money (Tourism); our arguments were largely ignored. The House Judiciary Committee, chaired by Maxine Grad, only allowed for a provision until July 1 2019 to allow currently scheduled competitions for 2018 to continue, but they forced a sunset date of July 1 2019 on out-of-state citizens. Interestingly, and while there are a large number of events held around the state that attract out-of-state citizens, the Vermont State Rifle & Pistol Association hosts a CMP Travel Games event in September that literally brings hundred upon hundreds of competitors from across New England and the nation into Vermont, where these honest and law-abiding citizens then spend a great deal of money on lodging, food, gasoline/diesel, area attractions and at stores. As a reminder, the mag ban portion of S.55 has been legally challenged as being unconstitutional in consideration of the Vermont Constitution, and that case will begin rolling on July 11th as currently scheduled. Regarding that challenge, we all need to know that this will be heard in Superior Court, and no matter who wins at that level, it will undoubtedly be appealed to the Vermont Supreme Court. I say this only to relate that this could take some time to resolve: HOWEVER WE ARE RESOLUTE. Many thanks to the Vermont Federation of Sportsmen’s Clubs, Chris, and your officers and members who have given so much, together with the Gun Owners of Vermont and others involved towards bringing the legal action you refer to. Vermonters deserve relief from the terrible mistake the state legislature made in writing the law and the worse mistake Gov Scott made in signing this dangerous bill into law. All you have to do is go across the border to NH and buy all the magazines you want tax free ! And NH welcomes the business. Background Checks on private sales ? All you have to do is date the receipt prior to the law being taking affect. However weak this legislation is it is not the real reason for it’s passing is so when the Progressives aka Socialists aka Communists get back in power you will see what they were really after, a so called assault weapons ban. Scott built the bridge half way there. The most powerful gun in the world does not make up for lack of accuracy. “Feel Good” legislation is the carrot to the left, but what’s behind the ever encroaching laws they write, as Michael Bielawski writes, is control over the public; what you can and can not do, say and can not say, eat, drink and can not – eventuating, if you let them, in what you can and can not think. The make up of the US Supreme Court is critical now as the left is working to dismantle our Constitution. Had Hillary taken office, you’d be seeing it be taken apart and with it your rights, our state and the country we once knew. Thank G-D for President Trump who is reversing that trend. Hopefully, he will succeed in appointing and seating two more constitutional conservatives to the US Supreme Courts by 2020. Opportune timing as the SCOTUS has a vacancy as of 6/27/18 12:00 noon.it will still be 5-4,however the vacancy created most likely be replaced with a swing vote. The governor is not only a failure but a self proven liar who by his actions has proven himself unworthy of any office including dog catcher. Civil disobedience. Ignore the law. Why do conservatives feel we have to obey some unconstitutional dictate? Make them enforce it. When you Listen to Liberals and their agenda. This just goes to show what happens when you pass “Hap Hazard” legislation when there is no forethought … just reaction to nothing! Hey, Governor more lost revenue not coming to the state. Great job. CHenry, you are exactly right! The liberals with their useles “feel good” legislation are ruining the state. It’s a sad day for Vermont.